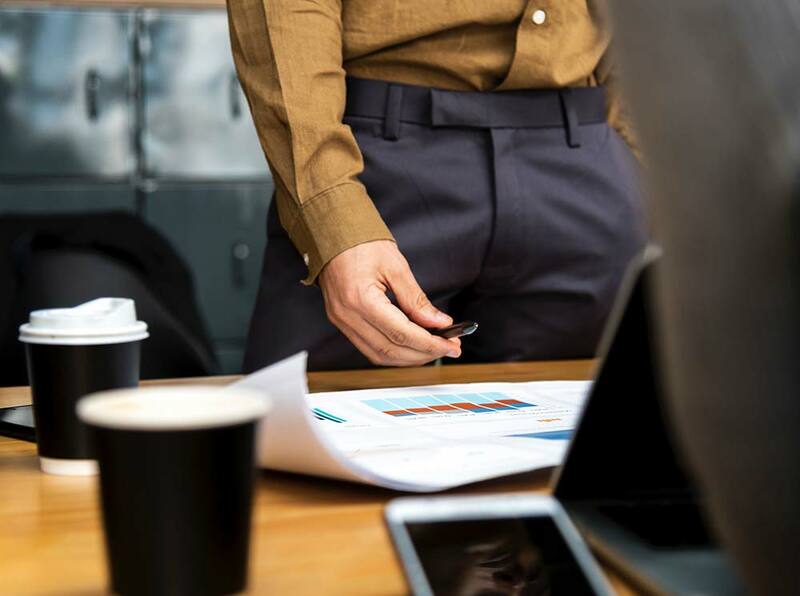 The basic premise of earned value management (EVM) is that the value of a piece of work is equal to the amount of funds budgeted to complete it. As part of EVM, project managers use the following information to assess schedule and cost performance throughout the life of the project. Planned value (PV): The approved budget for the work scheduled to be completed by a specified date; also referred to as the budgeted cost of work scheduled (BCWS). The total PV of a task is equal to the task’s budget at completion (BAC) — the total amount budgeted for the task. Earned value (EV): The approved budget for the work completed by the specified date; also referred to as the budgeted cost of work performed (BCWP). Actual cost (AC): The costs incurred for the work completed by the specified date; also referred to as the actual cost of work performed (ACWP). Monitoring a project’s performance involves determining whether it is on, ahead of, or behind schedule and on, under, or over budget. However, just comparing actual expenditures with the budget cannot tell the project manager whether the project is on, under, or over budget — this is where EVM proves beneficial. Monitoring planned value, earned value, and actual cost. Schedule variance (SV): The difference between the amounts budgeted for the work performed and for the work planned to do. The SV shows whether and by how much the work is ahead of or behind your approved schedule. Cost variance (CV): The difference between the amount budgeted and the amount spent for the work performed. The CV shows whether and by how much the project is under or over the approved budget. Schedule performance index (SPI): The ratio of the approved budget for the work performed to the approved budget for the work planned. The SPI reflects the relative amount the project is ahead of or behind schedule, sometimes referred to as the project’s schedule efficiency. The project manager can use the SPI to date to forecast the schedule performance for the remainder of the task. Cost performance index (CPI): The ratio of the approved budget for work performed to what was spent for the work. The CPI reflects the relative value of work done compared to the amount paid for it, sometimes referred to as the project’s cost efficiency. The project manager can use the CPI to date to project the cost performance for the remainder of the task. 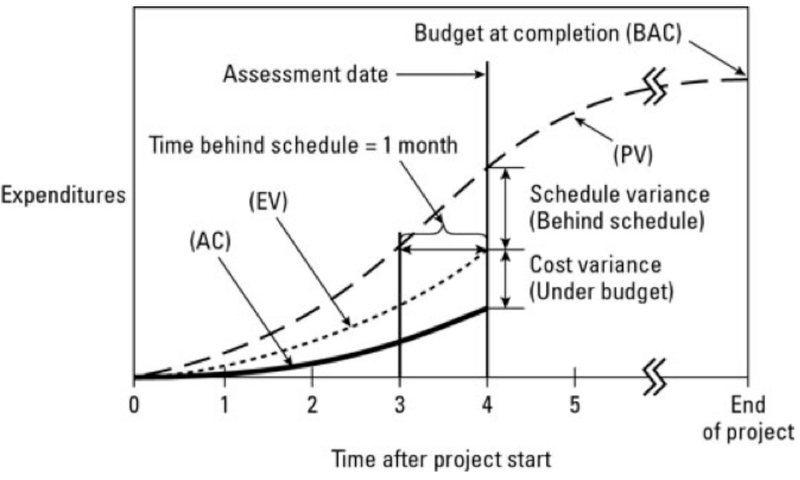 The project manager can approximate the amount of time the project is behind or ahead of the approved schedule by drawing a line from the intersection of the EV and assessment date lines parallel to the x-axis to the PV line. Doing so suggests that the project being described by the graph is about one month behind schedule. Method 1: Assume that the cost performance for the remainder of the task will revert to what was originally budgeted. Method 2: Assume that the cost performance for the remainder of the task will be the same as what it has been for the work done to date. 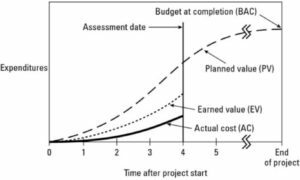 Different types of organizations establish various metric ranges for assessing the health of project initiatives using components of earned value management. Green = No scope changes have occurred to the original plan, or any scope changes that have occurred do not negatively impact schedule or budget. Yellow = Scope changes have occurred that have the potential to move schedule or budget into the yellow category. Red = Scope changes have occurred that have the potential to move schedule or budget into the red category. Green = No risks have been triggered, or any risks that have been triggered are being mitigated and will not negatively impact schedule or budget. Yellow = Risks have been triggered that have the potential to move schedule or budget into the yellow category. Does your organization lack the expertise to successfully address complex project and/or program management in a holistically cost-effective manner? Please use our contact form to reach out and find out how RTI can help to quickly get your important initiatives moving forward with the success you need today.